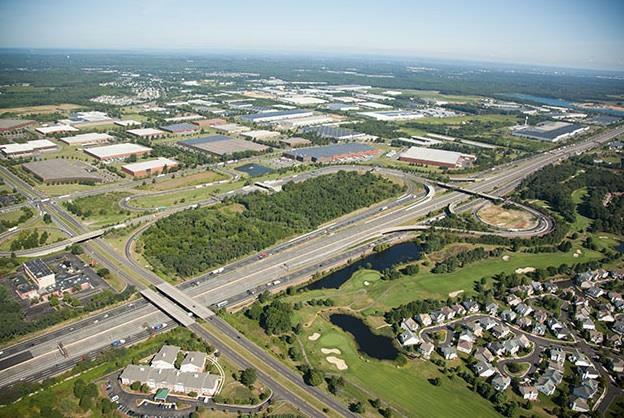 AEA provided roadway lighting and ITS design services for Interchange 8, Service Areas 6S and 6N, and multiple local road crossings (three sections out of eight) for the NJTA Interchange 6 to 9 Widening Program. The widening program consists of approximately 25 miles of road widening, the provision of new dual roadways, and improvements to interchange connections and service areas. AEA was sub-consultant to three different prime consultants and effectively managed submission schedules and deliverables. Our services for Interchange 8 included developing lighting design criteria and performance specifications for the state’s first conventional Single-Point Urban Interchange (SPUI). We performed warrant analyses and provided lighting design at interchanges, service areas, along ramps, and in coordination with the existing lighting systems. AEA designed new load centers to feed proposed lighting and designed modifications to existing load centers at service areas 6N and 6S. AEA coordinated with the facilities engineer for roadway lighting wiring connections into the toll plaza electrical power distribution equipment. AEA performed photometric, voltage drop, and conduit fill calculations to support temporary and proposed lighting systems. Various ITS components such as traffic detection systems, dynamic message signs, and camera surveillance were also designed by AEA as part of the projects. Roadway lighting and ITS along Route 33 and 133 was coordinated with all applicable stakeholders/owners and approvals were obtained on a timely basis to avoid any impacts on design or construction schedules. AEA performed coordination with utility companies to obtain electric service confirmation for all new load centers. Construction on all three sections is almost complete and AEA is providing construction support services. AEA worked on three sections (out of eight) for the NJTA Widening program. This widening program is constructing new dual roadways from south of Interchange 9 to Interchange 6. AEA provided civil, structural, Traffic and CADD design support as well as electrical, lighting, and ITS design services. AEA provided Traffic Control plans, ROW Plans, ITS and lighting design services under three separate Design contracts with three prime consultants. AEA performed quantity computations and developed cost estimates for AEA design items. In support of the Right of Way documents, AEA prepared the IPPM plans for the parcels being impacted by the widening. AEA provided civil and structural support to prime consulting firms as per their requirements. AEA aggressively managed the design work with all three prime consultants on all three sections to maintain the quality assurance and control delivered all three sections on-time and without delay. Currently all three sections are under construction and is AEA providing post design services.